We all know the left has a spectacular propensity for self-harm, from factionalism and splits, through to the alienating language that so many on the left tend to use, but the Cambridge Analytica Facebook data scandal has unleashed a truly spectacular self-harming campaign on the left. Left-wing people are taking to Twitter to call for others to #DeleteFacebook. Of course Facebook has some very serious problems, including the alleged misuse of Facebook data to create psychological warfare tools to rig elections, their hosting of disgusting terrorism-inspiring extreme-right hate chambers like Britain First for years, their continued promotion of fake news, and their willingness to allow political parties and campaigns to spread outright lies through targeted dark ads. I'm clearly not denying Facebook has serious problems, but to focus on all of the problems and refuse to recognise that Facebook was the scene of a massive left-wing victory during the 2017 General Election is wilful myopia. After decades of hard-right neoliberalism completely dominating the means of communication, suddenly Facebook provided a voice to people to express an alternative. Analysis by The Guardian found that every single one of the 30 most viral political stories on Facebook during GE2017 was pro-Corbyn, anti-Tory, or both. 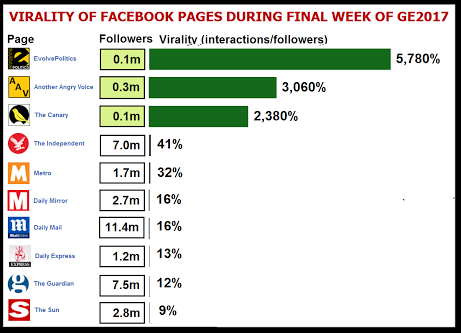 My own analysis demonstrated that a small rag-tag bunch of left-wing political bloggers completely annihilated the Tories and the mainstream press for Facebook virality during the final week of the GE2017 campaign. 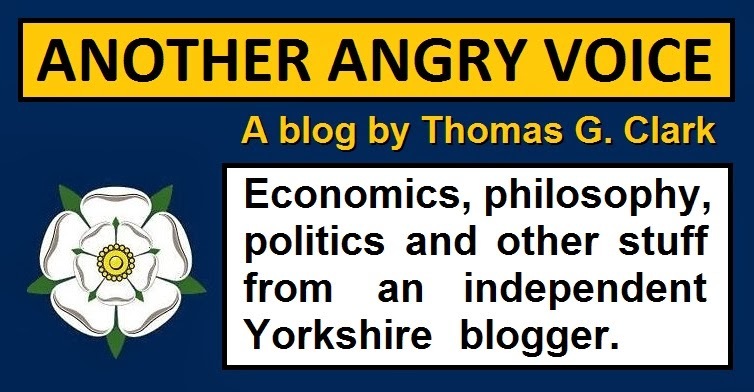 The 2017 General Election proved that there was an enormous public appetite for left-wing news that dared to step outside the parameters of the narrow spectrum of permissable mainstream media debate. People wanted to read analysis that offered an alternative to the ridiculous caricature of Jeremy Corbyn as an irredeemable and incompetent terrorist-sympathising communist, and they wanted to read analysis that actually held the Tories to account for the seven years of ruinous austerity dogma, wage repression, local government cuts, privatisation scams, and impoverishment schemes they'd overseen. 2017 was the moment that the left finally fought back against the mainstream media cheerleaders of neoliberalism, and Facebook was the battlefield on which this all-too-rare left-wing victory was won. So the idea that left-wing people should suddenly up sticks and abandon the vital media territory they've only just won, without even putting up a fight, is quite extraordinary. Some might argue that Twitter is a better platform for political debate, but anyone who thinks winning on Twitter would be enough on its own is completely delusional. Only 7% of British people have a Twitter account, significantly fewer are regular Twitter users, and even fewer still are deep into 'politics Twitter'. On the other hand almost half of British people have a Facebook account. 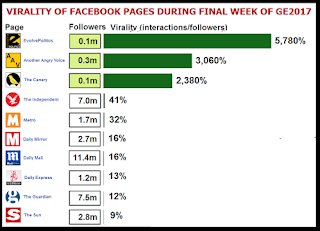 If you concede defeat on Facebook then you haven't got a chance of winning the social media battle. It's that simple. Nobody who is on Facebook to keep in touch with their friends and family is going to delete it over a load of Cambridge Analytica scandals they probably don't even understand that well. The right obviously won't care a jot that a dodgy company allegedly misused Facebook data to deliver Britain to a the Brextremists and the White House to Trump, so it's going to be predominantly lefties and liberals who go along with this #DeleteFacebook campaign. So the only people who are going to strop off Facebook are politically active people on the left. What could actually be a worse idea than left-wing people abandoning the largest and most effective social media platform of all, and leaving it to the Tories and the extreme-right? Facebook is a fantastic means by which politically engaged people like me can reach out to less politically engaged people to present alternatives to the right-wing tropes that remain almost ubiquitous in the mainstream media. And what's more is that the evidence shows that people are vastly more likely to share a political story if it's come to them via a friend, family neighbour, or work colleague than they are to share content that's been targeted at them in sponsored Facebook ads. Yet the #DeleteFacebook crowd are pushing for people on the left to just throw this fantastic means of reaching out to ordinary people away, and abandon it to the Tories and the extreme-right! Of course Facebook needs to be held to account for their actions. Of course Facebook has a responsibility to introduce new measures to combat stuff like dodgy data-mining, fake news spreaders, extreme-right hate chambers, and dishonest political dark ads. But you'd have to be completely and utterly delusional to imagine that a whole bunch of left-wing people deleting their Facebook accounts and conceding the biggest social media platform of all to the Tories and the extreme-right is a great idea. 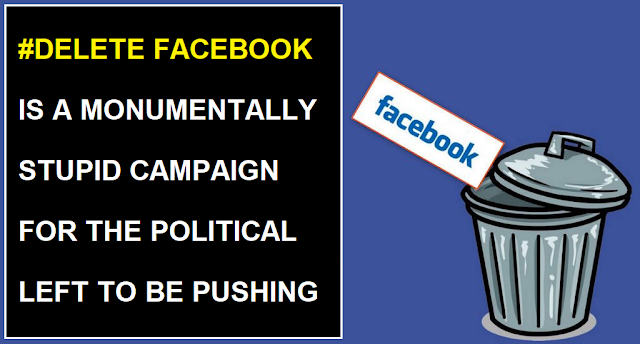 We only just cracked a way to counteract the nefarious influence of the billionaire hard-right press barons who have ruled the parameters of UK public discourse for decades, and these #DeleteFacebook melts want us to just throw it away!